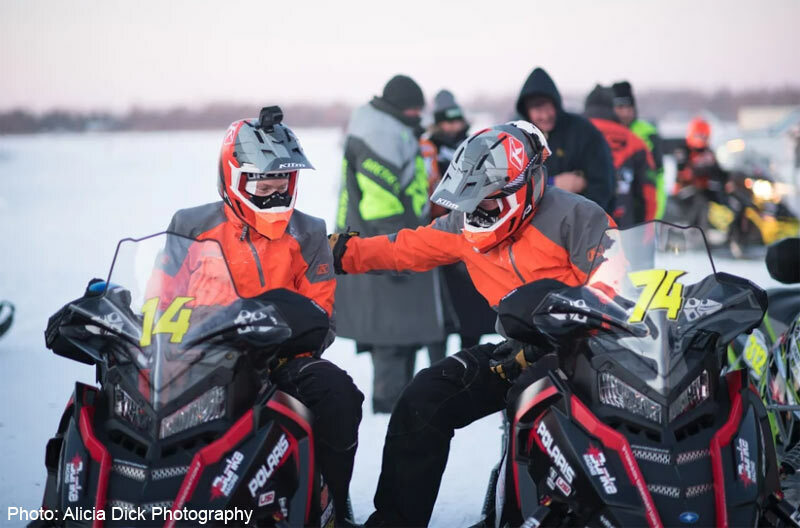 Moorhead, Minn. (December 31, 2017) –Bunke Racing claims podium finishes at the USXC Gerald Dyrdahl memorial Pine lake 100 in Gonvick, MN. Saturday morning was breathe taking to say the least. Mother Nature was making a statement with sundogs over the lake along with temperatures hanging at that minus 30 degree mark. Racing was delayed a half hour to allow for snow dust to clear and temperatures to rise. Thank god for dependable KLIM gear and duct tape. The first race of the day would be the pro open qualifier. The sleds left the line two by two to fight for the front row positions for the 2pm final. #14 Taylor Bunke was hot on the throttle clinching the fifth spot for a front row starting position. #74 Gabe Bunke was in hot pursuit when he had a mechanical failure- taking him out of the race. The Pro Open Final was a heads up race with snow dust unable to clear due to the bitterly cold temps and hard ice. The Polaris machines were charging looking to catch #15 Wesley Selby aboard his Arctic Cat. #537 Ryan Faust had the hammer down, but just couldn’t grab the number one position. Polaris would take two podium finishes with Ryan Faust in second and Andy Wenzloff in third. Taylor Bunke had a solid run finishing in the number four position. #874 Boe Bunke put down some fast lap times Saturday and Sunday in the Jr 14-17 and Sport 600 Limited classes. Boe would hit the podium in both classes securing second place finishes. Sunday was bitterly cold. The race was delayed an hour due to extreme cold temperatures. 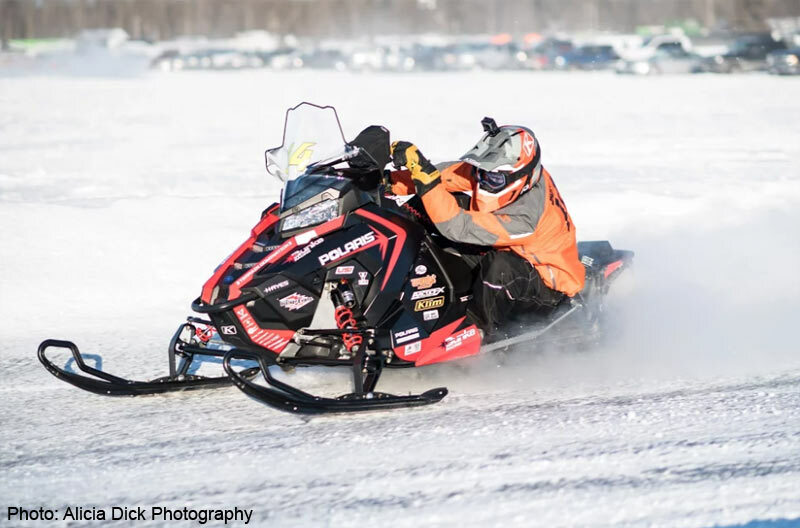 The first race of the day would be the Pro 600 qualifier; with Snow dust lingering on the lake the officials decided to start sleds 15 seconds apart leaving the line one at a time. The Pro 600 would be a 10 lap final with a mandatory fuel stop. The Bunke boy’s had their Polaris XCR Switchbacks hooked up like a cat on a rug. It was a cat and mouse event that left the spectators on the edge of their seats. Taylor Bunke took the lead on lap five. Gabe had his eyes on his son’s snow dust, sliding flawlessly around every corner looking to catch the number one spot. “I knew things were tight between Taylor and I and it took everything I had to keep the pace Taylor had set.” said Gabe Bunke at the end of the race. The top racers were tenths of a second apart mid race. 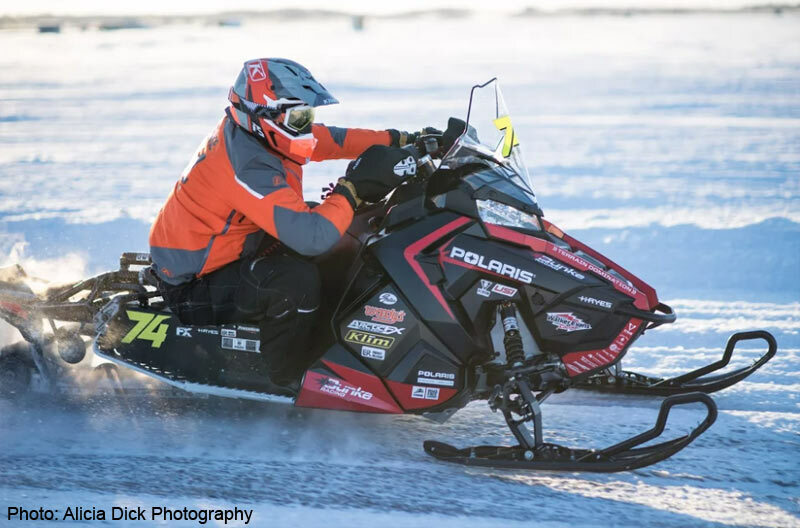 Arctic Cat rider Zach Herfindahl had a fast fuel stop and moved up into the third position. The Checkered flag flew and Taylor Bunke would clinch the number two position with his dad, Gabe Bunke right on his tail 4 seconds behind him to grab the third spot on the podium. “I am really proud of Taylor and Boe this past weekend in Pine Lake. Taylor has earned his podium finish due to his hard work and focus. Boe has been listening and learning with any advice given from his brother and it has definitely helped him get on the podium this weekend. I must say, this is a proud moment for me.” Says Gabe Bunke. This would be the first time in USXC history to have a Father/ Son on the podium in the Pro class. Up next for Bunke Racing will be the USXC Turtle River Rough Rider 100 on January 13th in Manvel, ND.